1. A Bigger Jail without reforms will compound racism. Explanation: Whatever the intent of individuals, the results of our current criminal justice system are racist. A bigger jail will only perpetuate the racial disproportion we are trying to eliminate. 2. A new and bigger jail would reinforce the problem of mass incarceration. Explanation: “If we build it, the system will fill it,” for it is the nature of systems to fill vacuums. By building a bigger jail we would perpetuate and exacerbate a broken system. 3. Eliminate or reduce the number of beds rented to Federal agencies in order to reduce overcrowding. Explanation: Part of the overcrowding in the current jail is caused by the County Commissioner’s decision to rent beds to Federal law enforcement agencies. The overpopulation puts incarcerated humans at greater risk and further dehumanizes incarcerated persons. 4. Use Community Supervision and free up approximately 300 beds. Explanation: As reported in the Spokesman Review recently, Spokane is underutilizing community services, which results in greater expense for our criminal justice system. Free up beds AND save money at the same time! 5. A new jail would extend and perhaps increase the bail problem; fix the bail problem and there will be many unoccupied beds in the county jail. Explanation: Spokane sets a dubious record for the highest percentage of people currently in jail within the Washington State held without bail. That percentage is 77.7%. To state the obvious, these people are presumed innocent, but they cannot afford bail. Spending time in prison creates hardship for these members of society, their families, and their employers. By incarcerating these innocent poor people, we jeopardize their employment, strain marriages and other relationships, and potentially separate them from their children. Going to trial wearing a prison jumpsuit increases the chance of being found guilty. Wasting months in jail motivates individuals to accept a plea bargain, even when innocent. 6. Increasing community and social services will reduce incarceration rates. Explanation: In February Spokane City Police made a presentation of a diversion program to the SRLJC, which illustrates this important point. The Jail Diversion Unit created in cooperation with Frontier Behavioral Health has already proven effective in reducing incarcerations and increasing police productivity by redirecting people with mental health issues to treatment, rather than to punishment. 7. Reform the criminal justice system rather than reinforce it. Explanation: There is broad agreement, both locally and nationally, that several aspects of the criminal justice system are dysfunctional. Spending millions of dollars on a new and bigger jail invests in those dysfunctions. When the reforms come, we will look silly having bet our money on a broken system. 8. Create a system that allows for full restoration. Explanation: Policies such as permanently removing voting rights for felons precludes the notion that they can ever have their full humanity respected and restored. 9. Restorative Justice requires smaller jails, not larger ones. Explanation: Punitive justice is not justice, but has become a means for our government to dehumanize its citizens. Criminal justice reform restores citizens to contribute to the greater good. Spokane School District is beginning to demonstrate the benefits of practicing restorative justice. Kurtis Robinson, representing the Spokane NAACP, spoke at SCAR's last general meeting via video. Listen to his well reasoned arguments on why Spokane does not need a new jail. Click here to visit Just Lead Washington for more info. SCAR Court Observers is open to all SCAR members who wish to support the victims of hate crimes and those who request community presence to prevent a bias in the courtroom. Please sign up for an hour that fits into your schedule. Even one hour makes a difference! Our Mission is to identify and address racial disparities through a variety of community efforts, which include education, advocacy, research, community engagement, impacting policy, and challenging existing organizations and structures.  Spokane Community Against Racism (SCAR) invited the public to attend a presentation Monday, March 25, to address efforts to build a new jail in Spokane and why alternatives are needed to better create a fair, efficient system of justice for everyone in the community. An online video (archived here) shows key GOP leaders in Spokane County hosting hate group organizer James Allsup at a July event. Allsup is a prominent member of the white nationalist group Identity Evropa. In April 2016, Spokane County was awarded a $1.75 Million MacArthur Foundation Safety and Justice Challenge Grant. However, in the two years that have passed since Spokane received the MacArthur Foundation grant, the enthusiasm from many of the community members who were initially engaged with the SRLJC has been replaced with frustration, dissatisfaction and disappointment. Get out the vote in 2020!